Southwest Airlines (LUV) has confirmed that it will bid for the assets of bankrupt carrier Frontier Airlines, scheduled to be sold in a court auction next month. Southwest's bid is said to be worth at least $113.6 million, placing it ahead of a $108.75 million bid placed by regional operator Republic Airways (RJET). 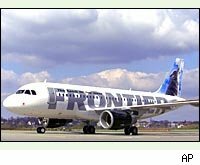 Frontier is the second-largest carrier at Denver International Airport, and has 51 aircraft, many of them newer Airbus models. Announcing Republic's original bid for Frontier, Republic CEO Bryan Bedford said, "Frontier has made tremendous strides during its restructuring process, recently posting its sixth straight monthly operating profit despite challenging economic conditions." The dualing offers create a potential bidding war, though tiny Republic, with a market cap of $175 million, seems ill-equipped to compete with Southwest's financial resources (a $5.8 billion market cap). While declining to give specifics on early-stage talks, a statement from Southwest CEO Gary Kelly said, "We see a strong fit between our Company cultures, a mutual commitment to high quality Customer Service, and similar entrepreneurial roots." News of the deal comes shortly after Southwest's investor conference call, in which Kelly called Denver "a huge market... [and] a very attractive destination" for the 100 million customers the company serves annually. He also said, "Our desire is to maintain the integrity of our fleet, which is, of course, an all–Boeing 737 fleet. We have absolutely no interest in any kind of a regional jet operation." Frontier Airlines uses Bombardier planes in addition to its Airbus fleet; Southwest has confirmed that it would retire non-737 planes. Southwest shares spiked 4 percent on news of the offer, which the company has until August 3 to make official. Republic shares, down as much as 7 percent earlier today, have recovered to trade flat with yesterday's close. James Cullen edits and writes at CollegeAnalysts.com. He has no personal position in the stocks mentioned above.